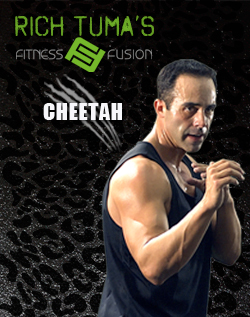 The Cheetah workout is a short intense workout for beginner/intermediate level individual who is on the go. It involves a combination of Chi Kung (for increased range of motion and warming up muscles and joints), Tae Kwon Do combinations that work the whole body, Kickboxing/plyometrics combos that increase strength, flexibility and cardiovascular system, boxing combos to work arms and abs, and Pilates/yoga to work abs and flexibility. This is the perfect workout for the individual who doesn't have time in their day to workout and wants a complete program to improves flexibility, balance, cardiovascular conditioning, strengthening muscles, abdominal strength, martial arts conditioning all in under 20 minutes a day.